LEARN THE CHORDS OF ALL THE MUSICAL INSTRUMENTS! Chords Maestro App helps you to find the right chords for each of the 7 selectable instruments – piano, guitar, bass guitar, ukulele, banjo, mandolin, and balalaika. The app also shows you instrument-specific notes or chord diagrams as diagrams and photos for selected chord, and the finger positions on music instrument keyboard or fretboard. Hello, Music Lover! If You need help to find the right chords for your music, try it with Chords Maestro! You can choose from 7 musical instruments: piano, guitar, bass guitar, ukulele, banjo, mandolin and balalaika. Pick your Instrument, pick your chord and play it! Also, Chords Maestro shows you instrument-specific musical notes or chord diagrams for your chord and the respective finger position on music instrument. If you like to try other instruments, go ahead! Just one click and Chords Maestro shows you how your chord looks like on a different Instrument and sounds! Left-handed? No Problem! The settings of the App show you all finger Positions for the left or right Hand, just as you want! And while You’re testing the settings, You can also adjust the volume. Let’s play some chords! Select your Instrument, then the chord (the key and the type of the chord). Now play it! You will also see what this chord looks like in the form of notes (piano) or in the Form of chord diagrams (string instruments). You’ll also see where your fingers must be to play the chord. With just one click you can change the Instrument and play the same chord or another. Chords Maestro can also help you develop chord progressions for your Songs, instrumental pieces or practice Sessions. Select your Instrument, then the first chord and click the Plus sign. Add your next chord and click on the Plus again. Continue until you have your desired chord progression. You can change the order of the chords as You want. If you want to sing to your piece, you can transpose the chords higher or lower depending on your vocal range. If You want to use the chord progression more often, You can save it in your favorites. Have fun with Chords Maestro! Download the App now! This App helps you to find the right chords for each of the 7 selectable instruments – piano, bass guitar, Ukulele, Banjo, mandolin, and Balalaika. Chords Maestro also shows you instrument-specific notes or chord diagrams for your selected chord, and the finger Position on your Instrument. Would you rather use another Instrument? Go ahead. 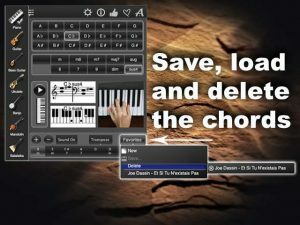 Chord Maestro shows you how your chord looks and sounds on another Instrument! Let’s start with the settings. If You’re right handed, You choose here is the picture of the right Hand if You’re left-handed, the image of the left Hand. This function is not available for the piano. You can also adjust the volume here. Let’s start with the piano. We choose a chord, the key and the type of chord. You can see what this chord looks like in the form of notes, and in the Form of highlighted piano keys. You can also see where your fingers have to lie to play this chord. Play it! Let’s change to another Instrument, for example, to the guitar. We’re gonna play the same chord. You see how the notes in a guitar chord diagram turned? And here’s the guitar grips. And a picture of the finger positions for this chord on a Guitar fretboard. Let’s play the same chord on all instruments! See how the notes, chord diagrams, and images adapt to the selected Instrument. You can also create entire chord progressions. Select your Instrument, then a chord, then click the Plus sign. Add to your next chord. Click the Plus again. Continue until you create your desired sequence. You can rearrange the chords as You want. If you want to sing to your piece of music, you can transpose the chords according to your range of voices. If You want to save your sequence, go to favorites, Save as, enter a name for your sequence, done! That’s it! Have fun with Chords Maestro!